The first thing that strikes me about AJ Meng is his kind and pleasant demeanour. 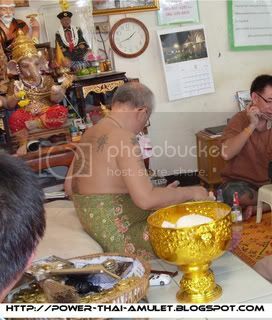 When I visited his Samnak in June 2010 he was sitting in the middle overseeing his looksit making sakyants on devotees. AJ Meng has been studying Visha since the age of 14. He has studied from a myriad of gurus along the years. He studied Vithee Tang, which includes the process of calling spirits to protect ones house, making of saney charms and other objects. AJ Meng studied Kru Lersi, Yant Nah Nah Thong and Yant Phrom See Nah according to the methods of LP Jong of Wat Nah Tang Nok and other yants according to LP Pan Wat Bang Nom Kho. LP Mee was showed AJ Meng how to collect the correct Wahn (herbs) for making powerful Khun Pean amulets. AJ Meng’s amulets are unique and known around the world to be efficacious, in simple English they work. AJ Meng’s amulets are especially well known in the areas of Charm, Sexual Attraction and Wealth attraction. Personally, I’m a fan of Ajahn Meng’s work after trying it for myself. I rented on your behalf some awesome amulets, which I hope you guys rent, love and cherish.